What conditions does Thera-D treat? Too much vitamin D can cause harmful high calcium levels. Tell your doctor right away if any of these signs of high vitamin D/calcium levels occur: nausea/vomiting, constipation, loss of appetite, increased thirst, increased urination, mental/mood changes, unusual tiredness. Before using this medication, tell your doctor or pharmacist your medical history, especially of: high calcium/vitamin D levels (hypercalcemia/hypervitaminosis D), difficulty absorbing nutrition from food (malabsorption syndrome), kidney disease, liver disease. What should I know regarding pregnancy, nursing and administering Thera-D to children or the elderly? Does Thera-D interact with other medications? 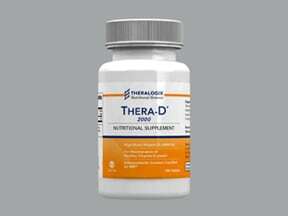 Have you ever purchased Thera-D?